In 1949, the Vincent Rapide was a superbike - its top speed of 110mph being very quick for the time. The Rapide's handling was pretty impressive, too. Philip Vincent had designed its cantilever rear suspension system, while still at school ... he just had not got round to founding the company yet! The Rapide's front-end was suspended by state of the art hydraulic forks. Naturally, such avant-garde engineering sought competitive expression. Land speed record attempts duly followed. In line with tradition, Bonneville Salt Flats - in Utah, USA - played host to them. Rollie Free topped out at fractionally over 150mph. His protective clothing consisted of shoes and swimming trunks ... yes, just shoes and swimming trunks. Now, that is commitment to aerodynamics! The 'Series C' Rapide was seriously good-looking! 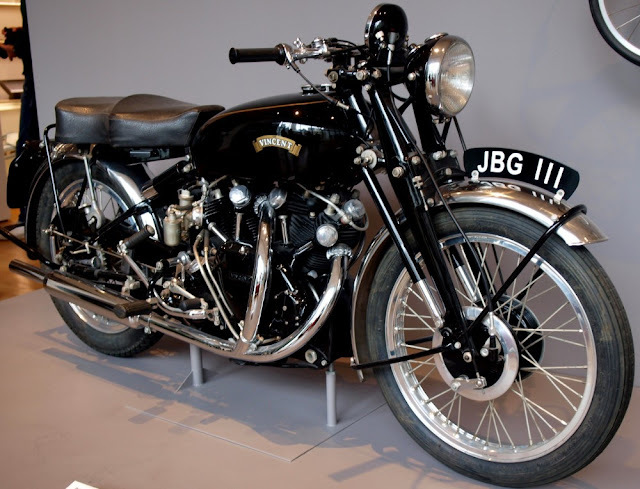 Vincent's scrolled emblem embellished a shapely tank - which sat astride a metal masterpiece of engine parts. There were pleasing lines everywhere you looked - latticed spokes, curved exhausts - and the deft diagonal of the rear shock. So, the Vincent Rapide was visually striking - and with performance to match. 'Series C', by name ... 'triple A' in every other regard!